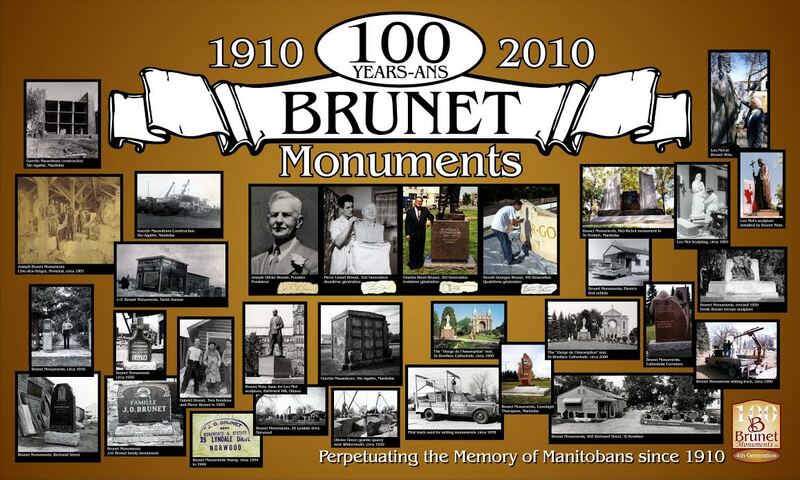 Brunet Monuments is led by Charles Brunet who operates the third generation family-owned business. developing beautifully artistic, unique and memorable monuments. a person’s life and to remember our loved one. Brunet monuments history as told by Charles Brunet 3rd generation craftsman of Brunet Monuments Inc.
Joseph Olivier Brunet was just a young man of 14 years when his father – a stone mason by trade – passed away accidentally. He helped his artistic mother the best way he could for two years when at the young age of 16 years old his frail mother succumbed to illness and also passed away. He found himself the eldest of 4 other siblings and was their only bread winner. Godias Rémi Brunet was Joseph’s only brother along with 3 sisters. Joseph O. would not allow his siblings to quit school to assist in the financial obligations and insisted they all attend and finish their education. Joseph O. had learned the masonry trade from his late father and other family members at “Monuments Brunets – Côtes des Neiges” in Montreal and was able to earn enough of a living to support his family. After several years, with work becoming scarce in Québec, Joseph O. left for the West, mainly Manitoba to find work. Joseph Olivier first arrived in St. Boniface at the turn of the century as a stone mason to build churches of which the church in Aubigny, MB comes to mind. He also built the beautiful and stately “College Universitaire de Saint-Boniface” of which his name is carved on the cornerstone. Between building projects Joseph always sold and carved memorials to increase his income. He eventually wrote to his brother Godias, a young educator by now to come to this Promised Land called Saint Boniface. Both Godias and Joseph O. found their future wives in the west and settled here to raise their families of which I am a descendant. Joseph’s brother Godias had 9 children of which he had a son named Pierre, who as a young child was fascinated with uncle “Jo’s” monument shop. Pierre began working after school. On Saturdays he began his apprenticeship as a hand letterer for his uncle. Pierre worked for many years at J. O. Brunet Monuments until one day in 1950, after 40 years of operations, Uncle Joseph passed away from a heart attack. Pierre who was his stone letterer asked his widowed aunt if he could purchase the business from her. In 1951 after a trial year, Pierre purchased J.O. Brunet Monuments. Pierre had 6 children of which he had a son named Charles who also as a young child, was fascinated and awestruck by the beautiful stonework at his father’s shop. Charles worked at his father’s shop after school, Saturdays, and during summer holidays. From the early age of 13, he swept the floors and all the while began learning the trade from his father. Charles at the age of 16 began working as a full time employee holding position of Setter/Carver. He respected his father, as Pierre was an accomplished artist who instilled a sense of pride in him saying, “if you do work that you are proud of, all else will fall into place”. In 1990 after another 40 years of prosperous operations by Pierre, Charles purchased the shop from Pierre. Over the last 45 years Charles has continued his father’s philosophy of only producing memorials that he would be proud enough to carve for his own mother. Since 1998 one of Charles 4 children, Benoît, has become an excellent carver like his forefathers. Honesty and excellent workmanship are one of the most important things that Benoît has learned from his early years at the shop. Benoît would relish those days when his dad would pull him out of school to help on those big jobs. The 4th generation of Brunet Monuments continues to perpetuate the memories of our loved ones.